President Bush stood before Congress more than two years ago and declared that North Korea was part of a three-nation "Axis of Evil." After a year of relative diplomatic silence on the reclusive nation, Mr. Bush's words set off debate in embassies around the world that still reverberates today. The president's supporters see his statement as his grand moment of moral clarity. Detractors say it was a vast oversimplification of three drastically different diplomatic relationships - with North Korea, Iraq and Iran - and was dangerously destabilizing. This much is clear: The "Axis of Evil" speech underlies two dramatically different approaches to how the Democratic and Republican candidates for president would broach this post-Sept. 11 world. This past week, the crisis on the Korean peninsula verged on a fever pitch as speculation arose about North Korea's possible preparations to test a nuclear bomb. Mr. Bush and Sen. John Kerry agree that North Korea must dismantle its nuclear program, but they are poles apart on how to accomplish this. Privately, experts say the crisis on the Korean peninsula represents possibly the most blatant foreign policy split between the two candidates. The benchmark of the Bush administration's approach to North Korea has been that no nuclear agreement is better than one littered with compromise and what it terms "appeasement." For this reason, Mr. Bush stopped diplomatic relations with North Korea early in his presidency. The cold diplomatic relations increased tensions. Jack Pritchard, who at the time of Mr. Bush's "Axis of Evil" speech was special U.S. envoy to North Korea, said in an interview that the president's blunt language "ultimately did undermine" his diplomatic efforts. Kerry says diplomacy is compromise, inferring that Mr. Bush's policy with North Korea is responsible for "letting a nuclear nightmare develop," as Kerry is quoted in Monday's New York Times. Depending on who wins the White House in November, "there will be a sharp difference" in the U.S. approach to North Korea, said Henry Sokolski, who from 1989 to 1993 was deputy for nonproliferation policy under Paul Wolfowitz at the Defense Department. Today, self-proclaimed nuclear power North Korea is the tinderbox of East Asia. Still, Sokolski supports Mr. Bush in what was initially a brazen diplomatic stance. "The approach is the difference [between the candidates] by those that want to get to 'yes,' and think that realism requires getting someone's word to not do something that they've done before and might do again," Sokolski said. "And those that want to make sure that the performance of these violators doesn't become a model for the others." The prevailing view in the Bush administration was that the 1994 Agreed Framework was appeasement that set a bad precedent. The agreement called for the freezing and eventual dismantling of the North Korean nuclear weapons program, in exchange for two 1,000-megawatt pressurized light-water reactors. In the interim, about 500,000 tons of heavy fuel oil was to be supplied to North Korea. It is now clear, Korea experts agree, that in the late 1990s North Korea continued to pursue a clandestine nuclear weapons program. For this reason, the Bush administration demanded verifiable dismantlement of North Korea's weapons program before it would again consider rekindling any similar agreement. The Clinton administration saw the agreement as the best possible solution of two bad alternatives: either go to war with North Korea or ignore its burgeoning nuclear program. It chose the middle ground by essentially freezing North Korea's known nuclear ambitions. Mr. Bush preferred a "bold approach, all at once," said Pritchard, who is no longer with the State Department. Pritchard added that President Bush didn't want to get "bogged down in long negotiations." Mr. Bush's "bold approach" was that diplomacy with North Korea needed to be all or nothing. President Bush chose nothing. The situation worsened. Following the January speech, in April 2002, "North Koreans finally sought" to rekindle Clinton-era negotiations on its nuclear program, Pritchard said. "At that point in time we believed we had the nuclear program under control," he added. But the policy shifted. President Bush refused senior level talks. Official relations between the two countries ceased. In response to being diplomatically cold-shouldered, North Korea's ultimate response was that it became openly nuclear. 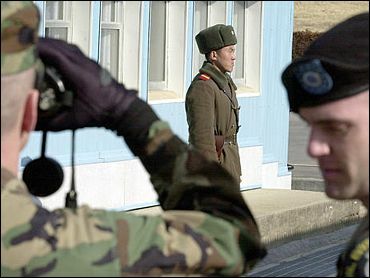 As the Bush administration pressed Congress to authorize an invasion of Iraq in October 2002, diplomacy in North Korea was at its lowest point in a decade. In breach of its agreement with the United States, the North Koreans had just admitted to pursuing a nuclear weapons program. As North Korea escalated tensions with the United States in the ensuing months, the Bush administration focused full throttle on pressuring Iraq to cede totally to its terms. If Iraq did not, invasion was threatened. While Iraq denied having weapons of mass destruction, North Korea was now repeatedly referencing its active nuclear program. On January 10, 2003, the rogue nation withdrew from the Nuclear Nonproliferation Treaty. On March 19, 2003, the war in Iraq began. If war is the last resort of failed diplomacy, President Bush viewed Iraq as a greater threat than North Korea. John Kerry does not. Repeatedly on the stump, the Democratic nominee cites North Korea as the primary threat of the time. Democrats insist a Kerry presidency would confront North Korea, as President Clinton did near the beginning and end of his administration. Republicans insist the Clinton administration was not firm enough. In their eyes, Kerry would be much the same. When the United States ceased official relations with North Korea under President Bush it was to the dismay of our closest allies in the region: Japan and South Korea. As the Bush administration has now reluctantly come to the table in six-party talks with North Korea, President Bush's refusal to partake in direct negotiations remains unpopular in South Korea. Ties between South Korea and the United States remain strained. The former special envoy, Pritchard, believes one drastic difference is that Kerry would renew this relationship. Though he differs from the Bush administration - Pritchard believes relations "require direct dialogue not to the exclusion of the six-party talks" - he admits the prior agreement with North Korea was flawed. Experts agree neither candidate would have attacked North Korea. The human cost is too high; the Korean Peninsula is too small. Critics are quick to point out that President Bush attacked Iraq, whose weapons capabilities were widely debated, while pursuing six-way negotiations with North Korea and its neighbors, despite little doubt about North Korea's nuclear ambitions. President Bush has said this is because he does not have a "cookie cutter" approach to foreign policy. "We now don't want to engage them directly," said Kurt Campbell, the deputy assistant secretary of defense for Asia and the Pacific in the Pentagon during the Clinton administration. "What we've also done is asked China to carry our water for us, to do our business on the Korean peninsula," Campbell continued. "So ironically, if you think of two prime American objectives in Asia, one is to stop North Korea from building nuclear weapons and the other is to keep China in context, not as the next great power in Asia. It had undermined one principle - i.e. insisting that China plays the convening role - in search of the other." But the Bush administration insists that at least now North Korea's transgressions are in the open. And despite what could have been done, whoever wins the presidential election inherits the current reality: a North Korea apparently on the verge of starting a nuclear arms race in East Asia.